As the real estate market becomes increasingly global, and with the power of new technology, buyers can cross international borders and time zones as they search for their ideal home. China especially is becoming a main source of overseas property transactions, and that interest landed buyers right here in the Granite State. 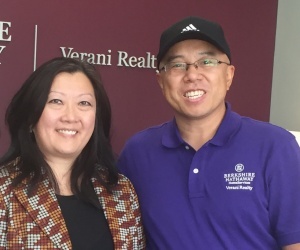 Verani agents Diana Kopp and Frank Wu, by combining their real estate skill sets and using their knowledge of Chinese language and culture, successfully helped buyer Ellen Xia, who lives in China, purchase her home in Hollis through the property portal Juwai. It was the first time that Berkshire Hathaway HomeServices agents in the United States had used the portal to successfully close a sale. Juwai.com is China’s top international property portal, connecting Chinese buyers with brokers and agents from 89 countries. It hosts sites and services on both sides of China’s “great firewall,” giving Chinese consumers access to listings no matter where they live. Kopp and Wu teamed up on the home purchase, combining Diana’s experience in corporate relocations and real estate transactions with Frank’s fluency in Mandarin. The whole process took a little over two months and culminated with Xia finding a property that fit her needs in Hollis. She was drawn to the area for its strong school system. The distance added some extra steps and challenges, especially the large time difference – 12 hours – and communicating property details in writing or verbally rather than through a showing. “I went to Hollis several times to take pictures of the houses my client expressed interest in, communicated the details of the house to her, and explained the functioning of some equipment that they had never heard of in China,” said Wu. Wu and Kopp bridged the time and distance gap through technology. Wu noted that they often used WeChat, a popular online messaging app, to get in touch, and many times this was late at night due to the time difference. Throughout the process, both agents had access to translation and support services with Juwai to make sure things went smoothly. Kopp and Wu received praise for going above and beyond by helping Xia settle in, showing her around the area after her closing so she could go to town hall to take care of any documents or registrations, learn about the school system, and meet neighbors. Xia specifically noted Kopp and Wu’s professionalism, responsiveness, and patience, and said in a letter she could not believe that it only took two months to find the home of her dreams. According to Juwai, Chinese overseas property transactions are predicted to hit $220 billion by 2020. Boston is currently the eighth most inquired about city, and Massachusetts is the sixth most requested state. The Greater Boston area is attractive due to its highly-ranked universities. As a close neighbor, interest in New Hampshire also has increased overseas – from 2015 to 2016 Juwai inquiries about New Hampshire properties increased 142%. The median inquiry price is $207,400, and overall consumer enquiry value is $21.1 million. Berkshire Hathaway HomeServices and Juwai announced a marketing partnership in spring of 2017. This allows Berkshire Hathaway HomeServices listings to appear on the portal and for agents to have access to a suite of services, including a dedicated team in China that helps Chinese buyers connect with their agents by assisting with translations, questions, and referrals.